The Mediterreneo fruit bowl holder was designed by Jewelry designer Emma Silvestris and Laura Polinoro for Alessi in Italy. Fruit looks so inviting in this artfully crafted fruit bowl, you may even find yourself eating more of the healthy stuff. The brilliant Alessi Mediterraneo fruit bowl is finished in 18/10 stainless steel with a sleek mirror polish finish. The Alessi Mediterraneo fruit bowl holder is an eye-catching centerpiece filled or empty! Beauty and design go hand in hand in the attractive design of the Mediterreneo fruit bowl holder. The Alessi Mediterraneo bowl is a beautiful rendering of sea coral as a container. The Mediterraneo fruit bowl holder is an eye-catching centerpiece regardless if it is filled or empty. Pressing the coral shape into a bowl form gives this item style. 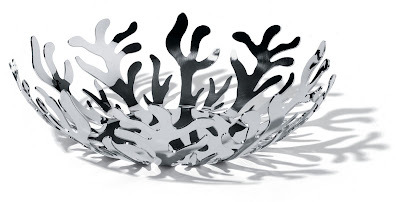 The mirror polished stainless steel fruit bowl that has laser cut out coral relief shapes is a brilliant gift. Place it on your kitchen or dining table to add glamor and style to your room. Treat yourself or your loved ones, this fruit bowl makes a great wedding gift, housewarming gift, anniversary gift, etc. A beautiful rendering of sea coral, the Mediterraneo bowl is an eye-catching centerpiece filled or empty. Jewelry designer, Emma Silvestris, came up with the design in 2009. The bowl is crafted of 18/10 stainless steel and coated in epoxy-resin. Available in a choice of colors and sizes, the 8-1/4-inch bowl stands 4 inches high. Pair it with the Mediterraneo napkin holder for a beautiful, well-coordinated table. Peruse the full A di Alessi collection for other artistic, like-minded pieces. The bowl should be hand washed for best care. It makes a great gift for newlyweds or new homeowners.